The second trimester is supposed to be the good part of pregnancy. The sickness has stopped, your ‘pretty hormones’ kick in (hair thickens, skin starts to glow, people say ‘wow you look well etc etc’), you’re not yet as big as a house so can enjoy being pregnant without drastically changing how you behave and considering which spaces you will and won’t fit through. And I have to say, thus far, this part of pregnancy has been delightful. (Although my pretty hormones don’t seem to be working, but perhaps they’re on the way…) I feel totally normal, aside from the little alien moving around inside me and the lack of alcohol and unpasteurised dairy in my diet. The only problem at the moment, is the awkward, in-between size of la bump. Everyone’s different and I’ve learnt that it’s almost impossible to guess how pregnant someone is from between 12-30ish weeks. Some people ‘pop’ early and get bigger and bigger, some people barely show until weeks before they’re due to give birth. And people delight in commenting on how big/small/round/tidy/high/low your bump is, how it compares to their friend X or their own bump, and what this means about baby size and stomach muscles. I realise that having an awkward sized bump is a pretty nice thing to be worrying about, so forgive my vanity. Speaking to my mum about the problem today, she offered much support. The only way to overcome said issue is with careful dressing. Not something that my usual sartorial routine of rotating between three pairs of jeans and six Zoe Karssen T-shirts allows for. My generous boss, mother of three, has kindly turned over her maternity wardrobe to me, but I’m not quite big enough to fill the stretchy jeans or do justice to the printed dresses. The answer? ASOS. As usual. Their maternity range is huge, and not just made up of wrap dresses. I picked up three dresses online that will tide me over until I have a bump to be proud of. 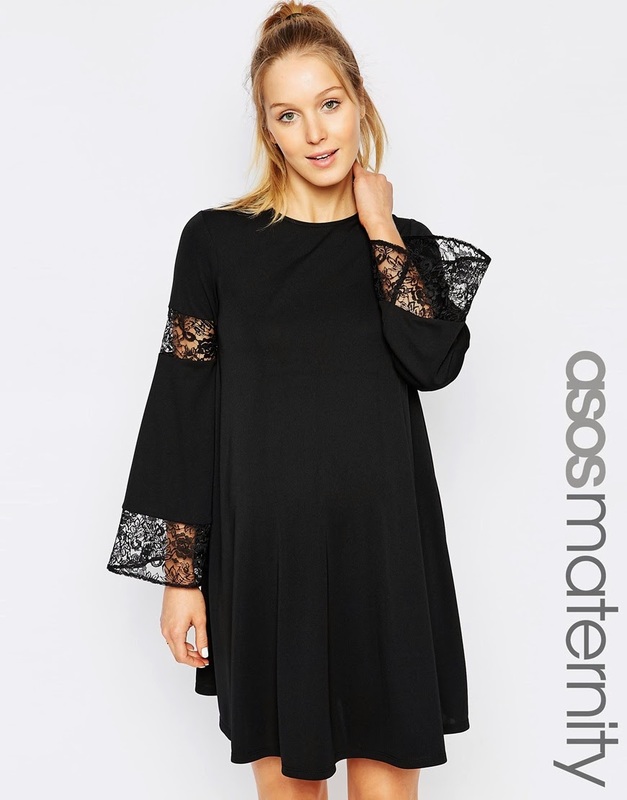 I picked dresses that I could picture wearing after my pregnancy, like this pretty ASOS Maternity Swing Dress With Lace Insert, £30. It’s flattering, comfortable and the perfect spring-into-summer length. I’ll be rotating my new buys, along with my last remaining pair of jeans that do up until I have a more impressive bump. Until then, I’m sure passers-by and fellow commuters will continue to wonder whether they should wrestle the sausage roll out of my hand, or offer me a seat. Play it safe London. Always go for the latter.